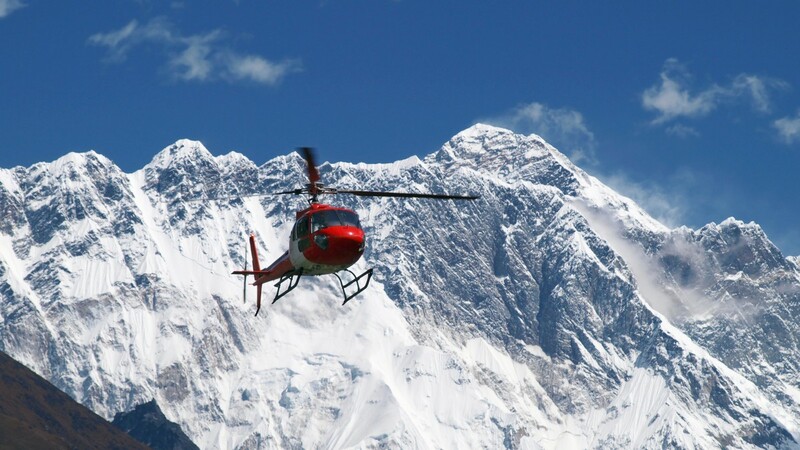 Nepal Guide info Team organized heli tour in Himalayas of Nepal :Your heli adventure begins from Kathmandu International Airport then It will be a spectacular one hour journey east , flying parallel to the what seems like unending Himalayan panorama, whose beauty you’ll definitely want to capture. Immediately after take-off, Mt. Ganesh Himal and Mt. Langtang appear to the north. Moving east, Jugal Himal and Gaurishankar Himal appear, followed by the Great Mahalangur Himalaya Range where the world’s highest mountain, Mt. Everest ,(Sagarmatha) lies. After about an hour’s flight, you will land in Lukla, where the helicopter will fuel up, while you can enjoy hot tea at Lukla . From Lukla, you’ll fly to Everest View Hotel, the highest five star hotel in the world, to enjoy a 3600 panoramic view of the Himalayan Panorama including Mt. Everest. After a short stopover in Everest View Hotel, you will head to Everest Base Camp, a special destination that many want to visit at least once in their lifetime. Landing in Gorak Shep, you’ll make a brief stop to enjoy another 3600 panoramic viewpoint of the Khumbu Himalayan range – Mt Everest and Mt Lhotse in the front, Lingtren and Khumbutse Peaks to the front-left and Mt Pumori to the left. There are numerous other peaks to the back-left, back and the back-right, plus Mt Taboche and Cholatse to the right, and Mt Nuptse to the front-right. After absorbing all these spectacular views, you will then descend down to Lukla and fly back to Kathmandu.